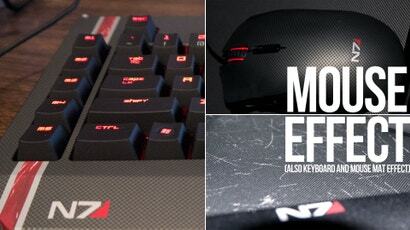 Whether you are fine with Mass Effect 3's original ending or plan on waiting until BioWare fixes up a fresh finale, this trio of branded Razer PC peripherals add comfort and coolness to your conclusion. Revealed last month as part of a large line of Mass Effect 3 products that also enhance the experience on iPhone and Xbox 360, Razer's PC trio aren't exactly new products; merely re-coloured versions of other proven pieces, packed with DLC codes to attract those of us addicted to the game's online multiplayer experience. 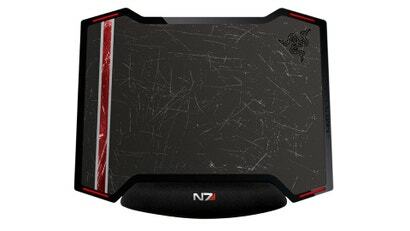 Each of the three products — the Imperator Gaming Mouse, BlackWidow Ultimate Gaming Keyboard and Vespula Dual-Sided Gaming Mouse Mat — feature the black, red and white N7 styling overlaid with the geometric webbing pattern seen on Commander Shepard's default armour. The overall effect is quite attractive and very, very Mass Effect, which is probably important seeing as the tie-in is the line's main selling point. The keyboard and the mouse both feature Razer's signature braided cable, which is supposed to dissuade tangles but really functions best as a way to determine which cables you are fiddling with in back of your PC case. It's a laser mouse! It's an optical mouse! It's both! 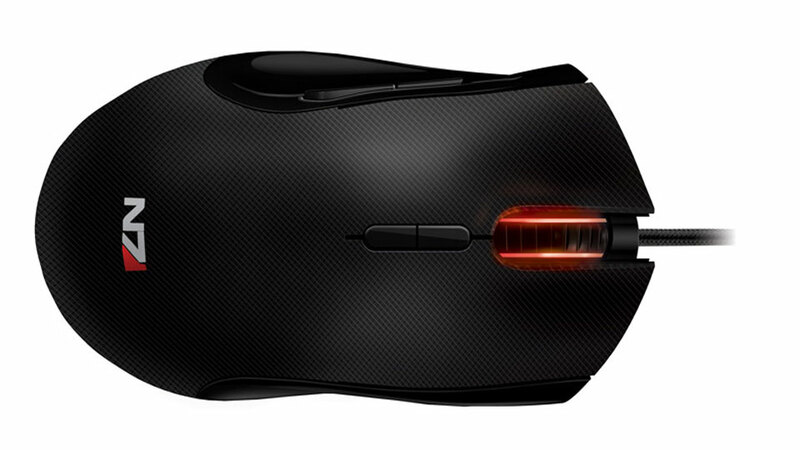 The key feature of the Imperator is the 6400dpi 4G dual sensor system, which combines two popular mouse technologies into one unit for enhanced accuracy. It's also got programmable buttons and onboard memory so you can take your favourite configuration on the road. For those concerned with ergonomics the rubberised thumb panel is nice and comfy, and the two side buttons can be adjusted backwards and forwards via a mechanical switch on the bottom of the unit. The Imperator is packed with nifty features. They aren't nifty features that add much to Mass Effect 3, but you're going to have to play something once the second ending is finished, right? The BlackWidow Ultimate is by far the sexiest piece of the trio, but then I'm a sucker for a mechanical keyboard. The action on the BlackWidow's keys is quite responsive, a supremely satisfying click accompanying every pressed key. It's a very tactile typing experience; you feel each letter typed. This is perfect for me, a typist that often trips over his own fingers. There are other selling points to the BlackWidow, of course. 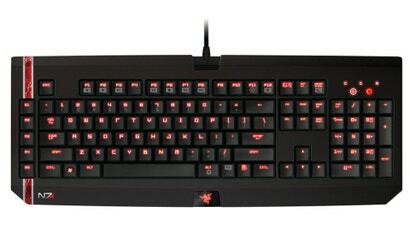 It's backlit, with five levels of lighting (including a confusing pulsing option), which is a feature I feel is required for a good gaming keyboard these days. Each key is fully programmable, with the ability to record macros on-the-fly built right in. It's even got pass-through sound and USB ports, another optional feature I'm always happy to see. The only problem I have with the unit is that the Mass Effect 3 decoration is an overlay that covers the caps lock and num lock lights, making them nearly impossible to see in all but the darkest lighting conditions. THIS HAS CAUSED ME MANY PROBLEMS. Sorry, caps. Since roller-ball mice went out of style I've not really been a fan of mouse mats, pads, or surfaces, seeing them as optional affectations that serve no real purpose (unless your desk top is a mirror, Mr Fancy Pants). Thus I was surprised at how much I've enjoyed using the Vespula mouse mat that rounds out the Razer Mass Effect 3 PC trio. It's not just about looks, though the dual-sided design (with and without scratches) is rather fetching. It's not even about having a stable, optimised surface. It's the fact that I now have a boundary for my mouse navigation. In the course of any given day my mouse normally travels the full extent of my desk top. It starts off lined up with my keyboard, takes a trip to the front of my dual monitors; sometimes it switches sides when I'm not looking. The Vespula reigns in my mouse's wild travels, keeping it at arm's reach and providing a comfy little cushion for my delicate wrist. There are, of course, thousands of products that do the exact same thing, but this one has the N7 logo on it, which makes it special. 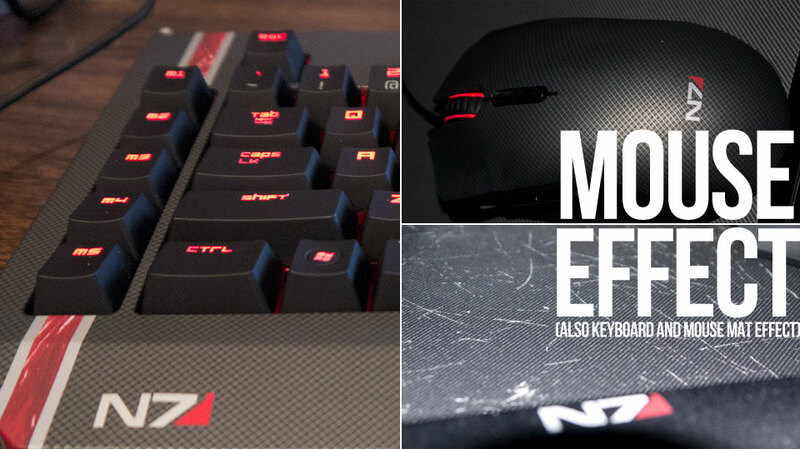 You can't really lose when you take three proven PC peripherals and give them a fresh coat of Mass Effect branded paint, especially when you take into account that you're not paying a premium over the standard versions of the Razer products. While I wouldn't recommend going out of your way to N7-ize your setup, if you're in the market for some fresh controls (and surfaces) you could do a lot worse. does this make games have a better ending ? LOL! I have a mirror for a tabletop. Damn I'm fancy sometimes. I didn't think of my mouse when I bought it, but a big mousepad solved the problem. I never really paid much heed to mousemats before, but after using a plain smooth XL Razer one, not only have I grown a large callus on my wrist, I can't game without it. It's a fixed friction, fixed area where you know your mouse will always work 100%. For the $30 that I paid for it I think it's well worth it.